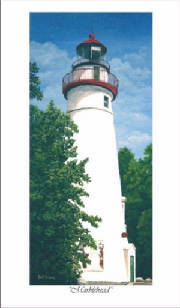 Marblehead Lighthouse Limited-Edition Prints, Note Cards, Lighthouse Books, Videos on Lighthouses of the Great Lakes, and much more! Find what you need for the lighthouse collector and nautical enthusiast. Do you need more information on Marblehead Lighthouse Ohio, it’s history, location, or current weather conditions at the lighthouse? At Outdoor Reflections, Marblehead Lighthouse Ohio website, we offer you all this and more. Marblehead Limited Edition Prints Now Available! Marblehead Lighthouse is located on the Marblehead Peninsula of Lake Erie. The tower is 65 feet high and is one of the oldest, continuosly operating, lighthouses on the Great Lakes. Click here for the perfect gift item for lighthouse collectors and nautical enthusiasts! All Marblehead images are the exclusive property of Outdoor Reflections and may not be copied.